ABR Imagery, Inc. ABR Imagery and Bethlehem Burners - ABR Imagery, Inc.
Bethlehem Burners has been manufacturing burners for over 60 years. 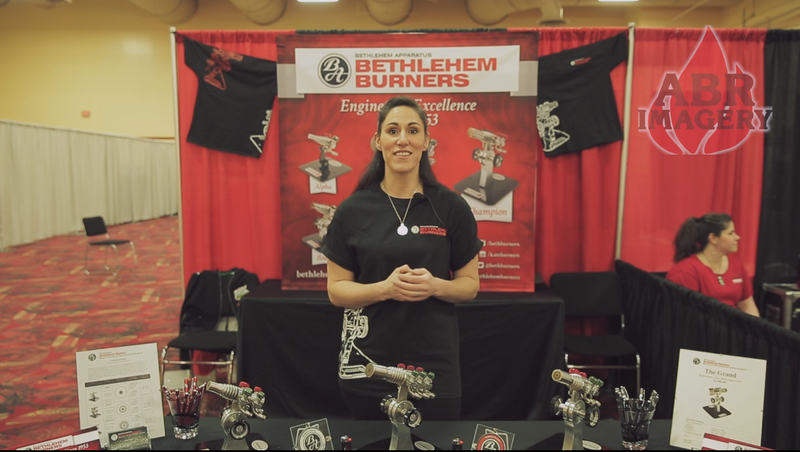 Recently, Bethlehem has decided to completely revamp its entire line of torches. They have been upgraded to accommodate the modern flame worker. All Bethlehem torches are constructed out of stainless steel. This not only makes the torches a beautiful piece in any shop, but they are stronger and more heat resistant than ever before. When running a Bethlehem torch, you’re going to be able to touch the barrel of the torch because its never going to overheat on you. All of the Bethlehem torches also come with modular valves. Modular valves allow you to be able to work on the valves without having to send the torch into the Bethlehem facility for repair needs. If anything happened for example, you would be able to remove the valve, send it in, and Bethlehem would be able to repair or replace it. This saves you from having any downtime when you have a backup valve ready to go. All of the Bethlehem torches are surface mix torches, which means, there is no internal combustion inside the torch barrel. This makes Bethlehem torches extremely safe, and also, the flames are very gentle on your glass. Bethlehem has also altered the gas to oxygen ratio in their revamped torch line. This allows you to run highly oxidizing flames that are not harsh to glass. This is very important to flame workers that are working glass that is very sensitive to the amount of oxygen in their flame, and that want to be able to use different types of striking colors. Another benefit is that the revamped torches allow workers to work flames and glass without the use of compressed air. People do like to add compressed air to their flames to soften them and generate the oxygen to make colors pop. Bethlehem torches gives you the same benefit without the compressed air, so the air becomes optionally only if you truly enjoy using it. If you are working very very sensitive colors, then Bethlehem is the torch for you. Bethlehem has also just developed a 3 stage torch. This is the first of its kind by Bethlehem in the over 60 years they have been manufacturing torches. Bethlehem listened to the needs of flame workers and delivered for them. This new Bethlehem three stage torch will produce more BTU than any other torch they have manufactured in the past. The torch will come with Bethlehem’s lifetime factory warranty. The torch will work with any two stage foot pedal, or you can also order the shower head manifold and convert it to a two port hose conversion. The new three stage torch will come standard with their scroll base, which no other torch manufacturer produces. You will be able to adjust your torch barrel while it is running, and it will automatically lock in place. This will come in stainless steel and won’t overheat on you. Future developments will include new hand torches, and the types of things that flame workers want and need from a quality burner manufacturer. Be sure to follow ABR Imagery on social media for the latest updates and product offerings from Bethlehem torches today!